SHOT Show is the largest gun/hunting trade show in the world, with tens of thousands of products and accessories on display. For a gun guy, going to SHOT Show is like being a kid in a candy store. We’ve seen that the SHOT Show 2019 videos we’ve showcased thus far have been very popular with our readers. So today we are bringing you five more SHOT Show videos, featuring products from Accuracy International, Proof Research, Savage, Thompson Center (T/C), and five pistol-makers. Here our friend Gavin Gear of UltimateReloader.com learns about the carbon-wrapped Proof Research barrels. Being lighter than conventional barrels, these Proof Research barrels definitely offer an advantage for hunters packing into the wild. The Proof Research carbon barrels have also performed very well in PRS/NRL tactical competitions. There is a lot of technical information shared in this interview, so it is definitely worth watching. Thompson Center Arms (T/C), a Smith & Wesson Company, is known for value-priced rifles that offer great “bang for the buck”. We’ve regularly featured T/C rifles in our Deals of the Week. There are some impressive guns in the T/C line-up, including the T/C LRR (Long Range Rifle). With an $1100 street price, this rig is a great value choice for PRS factory class. The rig balances well and we like the thumbwheel adjustments for LOP and cheek height. If T/C guns are bargains, then the Accuracy International (AI) line of rifles is at the other end of the spectrum. At SHOT Show this year AI displayed its Advanced Sniper Rifle (ASR) which will be submitted for SOCOM’s multi-caliber rifle program. This rig costs a hefty $19,544.00 as a “deployment kit” including three barrels (.308 Win, .300 Norma Mag, and .338 Norma Mag), two bolt bodies, key spare parts, magazines and a MilSpec transport case. The AI ASR employs a QuickLoc barrel change system for rapid caliber swaps. The rifle features a new two-position, AR-type safety and redesigned 2.5-lb trigger. The fore-end tube includes an RRS™-compatible rail, integrated top rail, and M-Lok™ mounting interface. For 2019 Savage unveiled some handsome, versatile rifles for backcountry hunters. These rigs feature nice camo finishes, adjustable AccuFit cheekpieces and buttpads, and barrels threaded at the muzzle for brakes or suppressors. We liked these new rifles, particularly the Model 110 High Country featured above. It has a tough corrosion-resistant finish and spiral-fluted barrel for weight savings. In this video, The Firearm Blog (TFB) presents its five favorite new-for-2019 handguns. TFB praised the new KelTec CP33, a VERY impressive new .22 LR rimfire target pistol, boasting a 33-round clear magazine. On Media Day, we shot the CP33 with a suppressor and were extremely impressed. The gun balances well, and the trigger is EXCELLENT — really surprisingly good. Glock attracted attention with the new Glock 43X and 48 silver-slide models. The 43X does offer more capacity (10 rounds) with a longer grip vs. the Glock 43. Buyers may be attracted by the silver PVD-finished slide. Frankly, that’s nothing more than cosmetics and the Glock still retains not-so-great ergonomics and a mediocre trigger. There are better striker-fired, DAO polymer-framed pistols out there, for less money. New KelTec CP33 is a high-capacity winner, with a great trigger. Share the post "Midweek Movies — More SHOT Show 2019 Product Videos"
There is so much to see at SHOT Show, with nearly 2000 exhibitors showcasing tens of thousands of products. SHOT Show is the largest trade show of its kind in the world, attracting 60,000+ attendees from more than 100 countries. Thankfully there are many teams of reporters who covered SHOT Show this year, and they’ve now posted a wide selection of video reports. In today’s SHOT Show video showcase, we post our “pick of the litter” — ten of our favorite video reports from SHOT Show 2019, plus one great video “blast from the past”. The Strasser rifle from Austria has many interesting design features including an interchangeable bolt head and an easy, rapid barrel-swap system. MORE INFO HERE. Media Day Mini-Gun Mania — 25 and 50 Rounds per Second! This full-auto, multi-barrel Mini-Gun has two speeds — 25 and 50 Rounds per Second! Share the post "SHOT Show 2019 — Video Showcase"
Savage will launch 40 new products at the 2019 SHOT Show in Las Vegas. This will be a big year for Savage as 2019 marks Savage’s 125th Anniversary. The brand is celebrating the historic event by offering limited-edition rifles as well as many new offerings in bolt-action rifles, AR-platform rifles, and shotguns. “Whether you are looking for a training rifle, a competition-grade modern sporting rifle, a reliable shotgun for hunting or personal defense, or a lightweight hunting rifle packaged with a scope, Savage has those needs covered, plus more”, said Savage’s Marketing Director, Beth Shimanski. Savage is expanding the popular XP scoped rifle lines. New models include the 110 Apex XP series, featuring Vortex scopes, and a pint-sized Rascal Target XP. Plus, the existing AXIS XP series has been upgraded with a new modernized stock. Savage’s MSR 15 and MSR 10 AR-platform rifle series will include new options for long range, precision and competition shooting. These rifles are not cookie-cutter AR clones. The MSR Savages have some interesting upgrades, such as side-charging handles (on MSR 10), Magpul PRS stocks, adjustable gas blocks, and tunable muzzle brakes. The MSRs also enjoy a good reputation for build quality and reliability. All of these new rifles, as well as more bolt-action and semi-automatic centerfire and rimfire rifles, will be on display at SHOT Show Booth No. 14551 January 22-25, 2019 at the Sands Expo Center. Share the post "Savage Will Launch 40 New Products at 2019 SHOT Show"
10 BEST Bolt-Action Rifles of All Time — What Do YOU Think? 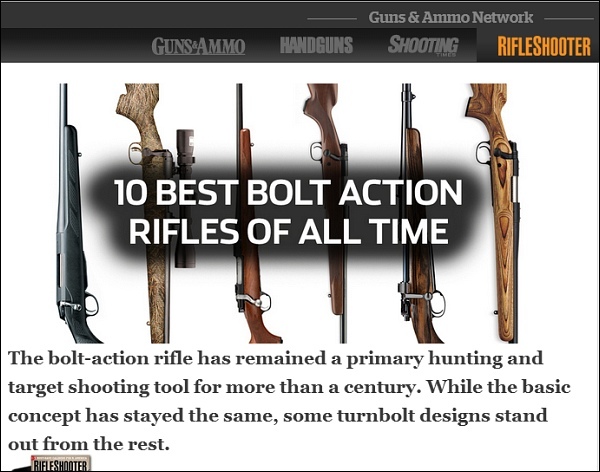 A while back, RifleShooter online magazine published a list of the purported Ten Best Bolt-Action Rifles of All Time. Ten classic rifle designs (including the Remington 700 and Winchester Model 70) were featured with a paragraph or two explaining their notable features. These Top 10 lists are always controversial. While most readers might approve of half the entries, there are always some items on the Top 10 list that some readers would challenge. Here is RifleShooter’s Top 10 list. What do you think? Are there some other bolt-actions that are more deserving? Share the post "10 BEST Bolt-Action Rifles of All Time — What Do YOU Think?" Savage Arms now has a Service Program with discounted pricing for all active duty, veteran and retired military, first responders, and law enforcement personnel. Savage is offering 30% off Savage firearms to those who serve in the military and who “protect and serve” our communities. The Savage Service Program offers qualified personnel the opportunity to directly purchase firearms at 30 percent off Manufacturer’s Suggested Retail Price (MSRP) which will be shipped to their preferred Savage dealer for delivery. Official program dates are September 1, 2018 through December 31, 2018. Eligible participants may purchase two firearms per calendar year under this Savage program. Qualifying customers must submit a Program Order Form, supply a copy of their preferred ship-to FFL, and provide a copy of their law enforcement or military credentials. Limit of two firearms per calendar year under this program. Discounts not applicable on special order (custom) firearms. For more information, visit https://www.savagearms.com/savage-service-program. Share the post "Savage Discount Program for Military, Police, First Responders"
Barrel nut system allows “Pre-Fit” barrel installation on a Remington action. CLICK photo to zoom. Installing a new barrel on your Remington 700 (especially without a lathe) may seem like a daunting task, but thanks to companies like McGowen Precision Barrels, there are easier alternatives. By adopting a Savage-style barrel nut on a 1 1/16″ thread for a Remington 700 receiver, pre-chambered (aka “pre-fit”) barrels can be easily swapped with just a few hand tools. This system is sometimes called a REMAGE conversion (for “REMington savAGE”). With simple tools a “Pre-fit” 6mmBR-chambered barrel was installed on the author’s Remington action — no machining or lathe-work required. Using a few tools from Brownells: Remington 700 Action Wrench, Barrel Vise, Go and No-Go Gauges, Recoil Lug Alignment Tool, and a Savage Barrel Nut Wrench, I was able to swap the .308 Winchester barrel off of my Remington 700 short action and install the new McGowen pre-fit, pre-chambered barrel, converting it to a tack-driving 6BR (aka 6mmBR Norma). The existing barrel is simply removed from the action (normally the hardest part) and the new barrel is screwed on with the Go Gauge in place. After headspace is verified with the Go Gauge, the barrel nut is tightened against the action and you are off to the range. It takes all of the machine work out of the barreling process. Note: Because barrel nut has a slightly larger diameter, some stocks may require minor inletting. Also, if you are shooting fired brass from another rifle with the same chambering, you should FL-size the brass before loading it for your new pre-fit barrel. And always check the set-up with a dummy round loaded to normal cartridge length BEFORE you head to the range. With Pre-Fits, the freebore should be adequate for your cartridge, but always check and adjust your seating depth as needed. My McGowen Remage barrel looks and shoots great. I’ve written two longer articles that provide greater detail about this project. To learn more about how the barrel was installed, read: Rebarrel a Remington 700 without a lathe: McGowen’s Remage barrel conversion. To see how the rifle performed at the range, read: McGowen Remage Barrel Review: Spoiler Alert- It Shoots!. Bill has been a serious shooter for over 20 years. A former Marine Corps Sergeant, he’s competed and placed in High Power Rifle, ISPC, USPSA, IDPA, 3-Gun, F-Class, and precision rifle disciplines. In addition to being an NRA-certified firearms instructor and range officer, Bill has hunted big game in North America, South America, and Africa. Bill writes extensively about gunsmithing, precision rifles, and the shooting sports on his blog, Rifleshooter.com. Share the post "“REMAGE” Remake — Converting Remington to Barrel Nut System"
There a number of good rebate programs going on right now, but some conclude in just a few weeks. To take advantage of these deals you’ll need to start your shopping soon. Here are some current Rebate Programs for rifles, optics, ammunition, reloading gear, and shooting accessories. You can save up to $125.00 with these direct Rebate offers, or you can get bullets worth over $150.00 (500 count). Bushmaster has a very attractive rebate right now — but you’ve got to act soon. You can save $125.00 on the most popular Bushmaster and DPMS models. Bushmaster QRC rifles are $75 off, while the DPMS Oracle models (both .223 and .308) are $50 off. Act soon to qualify for this Mid-Year promotions which ends July 31, 2018. Purchase a Model 10 Savage® Ashbury Precision, 10/110 BA Stealth, or 10/110 BA Stealth Evolution and receive a $100.00 Factory Rebate. These rifles are available in a variety of chamberings. FFL Dealer required for purchase. Nikon now offers $50 Instant Savings on the new Nikon Monarch 3000 Laser Rangefinder with image stabilization. This stabilizing system really works — allowing you to range distant objects faster and more reliably. Receive 100 or 500 Free Bullets when you purchase select Hornady Products. 500 Free Bullets with: Iron Press Kit, Ammo Plant, AP Press, Classic Kit, Classic Kit Deluxe, Hot Tub Sonic Cleaner and More. Purchase a Bushnell AR Optics riflescope (excluding red dot) to receive $40 back. Qualifying purchases must be made 6-18-18 through 7-31-18. You’ll have to act soon on this rebate — purchases must be made not later that July 31, 2018. That’s upcoming Tuesday, just two days away. Get up to $50 BACK. Get $5.00 back for each box of Fusion® rifle ammunition by Federal you purchase. Limit 10 boxes/$50 per address. Rebates are available on other types of Federal Ammunition. Share the post "Factory Rebate Programs for Summer Savings"
Savage Arms just completed a major overhaul of the Savage website. Now the SavageArms.com site is more mobile-friendly and easier to navigate. Savage has expanded information on its rifle products, and also created a new Expert Advice area. This new section of the website offers informative technical articles/videos, as well as numerous helpful tips for hunters. You’ll find 47 informative topics in the Expert Advice section of the updated Savage website. Below are FIVE of our favorites, all with linked videos. Even if you don’t own a Savage, these features are useful. And all new shooters should definitely check out the Eye Dominance selection. This features a very helpful video that explains this important topic. Share the post "Savage Offers Expert Advice on Updated Website"
Big news. Vista Outdoor Inc. (NYSE: VSTO) may be selling off gun-makers Savage and Stevens, declaring it will “explore strategic options” for those brands. However, Vista Outdoor will retain its businesses that produce ammunition and reloading components: Alliant Powder, CCI, Federal Premium, and Speer. The sell-off of Savage and Stevens is not a sure thing yet, but Vista’s new CEO Chris Metz has been looking hard at the “bottom line” and he says that the gun-making brands have not been as profitable as expected. This is not just an exit from gun-making. Vista Outdoors executives have analyzed the company’s full portfolio of brands, and decision-makers have targeted other brands for sell-off. READ Vista Outdoor News Release. Notably, Vista Outdoor remains fully committed to the ammunition and components businesses. In an official news release, CEO Metz stated: “Vista Outdoor is excited about the potential of each of our core businesses, particularly ammunition, which is our largest core business. An increased focus on our heritage ammunition business will manifest itself in more innovative and breakthrough new products introduced over the next few years. We also anticipate that by prioritizing this business, we will be able to invest more capital to further enhance and expand our global leadership position.” Metz denied that the sell-of of Savage and Stevens was a response to a boycott by the REI outdoor retail chain. The CEO said that REI represents less than 1% of the company’s total sales. Vista Outdoor currently has a large portfolio of brands, including guns, gear, eyewear, ammunition, camping equipment, and much more. Top brands for guns and shooting, after Savage and Stevens, are: Alliant Powder, American Eagle, Blazer Ammunition, Bushnell, CCI, Federal Premium, RCBS, and Speer. Share the post "Vista Outdoor May Sell Off Savage Arms and Stevens"
Looks like MasterPiece Arms (MPA) stocks are a top choice for the tactical game. MPA chassis systems have been used to WIN 5 of the last 12 matches in the Precision Rifle Series (PRS). The MPA BA Chassis was used by David Preston to win the Carolina PRS Match, Defiance Long Range Shooting Experience (LRSE), and Rocky Mountain Mayhem PRS Match; by Matt Brousseau to win the Bushnell Lonestar Challenge; and by Matt Rooks to win the MPA Spring Shootout. Five of twelve works out to a 42% win percentage — pretty impressive considering all the stock/chassis options on the market today. The MPA BA Chassis was recently surveyed to be the number one chassis/stock system used by PRS competitors in the PRS 2017 Finale Gear Survey. It experienced a 900% increase in use in 2017 from 2016, which was by far the biggest jump among all chassis systems used by PRS competitors. MPA’s president, Phil Cashin, is an active PRS shooter. He finished in the top 100 in 2017 and qualified for the finale last year. Cashin, shown in the video below, regularly tests out new ideas and upgrades in actual competition and he regularly seeks out feedback from top tactical competitors. As they say, competition improves the breed. MPA also offers a PRS Production Class Rifle (PCR) using the MPA Chassis system mated to a Savage Model 12 action. Production Class rifles may cost no more than $2000.00 before optics. Designed specifically for the new PRS Production Class, MPA’s PCR Competition Rifle offers many premium features yet stays under the $2,000 Class limit. The Savage action is upgraded with a Rifle Basix 2-lb trigger, and the adjustable, modular chassis offers a bag rider, barricade stop, and built-in bubble level. For more information on the MasterPiece Arms product line of rifles, chassis systems and accessories, visit www.Masterpiecearms.com. Share the post "MasterPiece Arms Chassis Systems Used by PRS Winners"
If you watch just one episode of Shooting USA TV this year, it should probably be this week’s hour-long SHOT Show Special. Tonight, March 14, 2017, enjoy a full hour of SHOT Show coverage. Jim Scoutten’s team of gun journalists work hard every January, bringing you highlights from the gun industry’s largest trade show. Jim, son John Scoutten, and other staffers prowled the 12 miles of aisles in the Sands Convention Center in Las Vegas, visiting many of the 1,600+ exhibitors. This episode provides a “first look” at the new guns, optics, and gear introduced for 2018. Click HERE to learn more about this week’s 2018 SHOT Show episode. 2018 SHOT Show Highlights: Ruger Precision Rimfire, Sig P365, M1A in 6.5 Creedmoor, MR-10 Bolt Action Comp Rifle, Colt Competition 1911, and a whole lot more. Shooting USA’s SHOT Show Special will air for a full hour on Wednesday, March 14, 2016 on the Outdoor Channel. Here are the air times, but you should check your local schedule. Look for Shooting USA TV on the Outdoor Channel. Share the post "2018 SHOT Show on Shooting USA TV"
Savage Arms will launch more than two dozen new products at the 2018 SHOT Show, January 23-26 at the Sands Expo Center in Las Vegas, Nevada. The big news is the AccuFit stock system for the Model 110 rifle line. “Our new AccuFit System is designed to allow shooters to quickly adjust comb height and length-of-pull for a customized fit. This results in more consistent, more comfortable shooting”, says Beth Shimanski, Savage Senior Marketing Manager. These new Savages also feature the Accustock internal chassis with bedding block (see second video below). CLICK HERE for more videos showing new Savage Design and Engineering features. Savage has added new chamberings for its MSR black rifle line-up. MSR 15 models will be newly offered in 224 Valkyrie, 22 Nosler, and 6.8 SPC. A 6mm Creedmoor version of the AR-10 platform MSR 10 Long Range has been added, and Savage will offer the hard-hitting .338 Federal chambering in the MSR Hunter rifle (along with 6.5 Creedmoor and .308 Win). Model 110 Storm with AccuFit: Features stainless steel action and barrel for adverse weather and conditions. Sixteen caliber and left-hand options. Model 110 Long Range Hunter with AccuFit: Engineered for long-range shooting with a 26-inch barrel and muzzle brake. Nine caliber options, including 338 Lapua Magnum. Model 110 Lightweight Storm: Easier to carry in field thanks to a lightweight stainless steel barrel and action. Length-of-pull is easily customized. Six caliber options. AXIS II XP with New Stock: Popular package rifle with redesigned, ergonomic stock and Bushnell Banner 3-9×40 scope in full-size and compact models. Twenty caliber/configuration options. MSR 15 Valkyrie: MSR 15 AR-type rifle chambered for the 224 Valkyrie. This new model features an adjustable gas block, furniture upgrades, and Elite Series Flat Dark Earth Cerakote finish. MSR 15 Recon Long Range Precision: Equipped with alternate furniture options and chambered in all-new 224 Valkyrie, 22 Nosler, and 6.8 SPC. MSR 10 Long Range in 6mm Creedmoor: AR-10 platform rifle design for long-range precision shooting. Chambered for the flat-shooting, modest-recoil 6mm Creedmoor cartridge. MSR 10 Hunter in 338 Federal: Built specifically for hunters and chambered in the popular, hard-hitting .338 Federal. B Series Compact and Left-hand: Extremely accurate bolt-action .22 LR, .22 WMR, and .17 HMR options. Now available in compact and left-hand models. A Series Pro Varmint: Semi-automatic options in .22 LR, .22 WMR and .17 HMR, all with Boyd’s Pro Varmint stock and 22-inch fluted, heavy barrel. All of these new rifles, as well as more bolt-action and semi-auto centerfire and rimfire rifles, will be on display at SHOT Show Booth No. 14551. Most will be set up so visitors can handle the rifle and work trigger and bolt. To learn more about the new Savage rifles and their features, visit www.SavageArms.com. Share the post "Savage New Products — Adjustable Stocks, More Chamberings"
SHOT Business, an NSSF publication, has just revealed a host of new-for-2018 rifles. These new rigs will all be on display at SHOT Show in Las Vegas next month. These new rifles run the gamut — from muzzle-loaders to modern-day Tommy Guns. As you’d expect, there are AR-platform rifles, and modular PRS-type rigs. There is also an interesting new rifle from Savage that looks very Tikka-esque. Read the full SHOT Business article to learn about new rifles from 17 manufacturers: AutoOrdnance, Bergara, Browning, Bushmaster, CMMG, CVA, CZ-USA, DPMS, E.R. Shaw, Mossberg, Proof Research, Remington, Rise Armament, Savage Arms, Steyr, Weatherby, and Winchester. Among the many new rifles to debut at SHOT Show 2018, here are three that caught our eye. Savage has upgraded its hunting rifle offerings with adjustable, internal-chassis stocks, Bergara continues to build a good reputation, and Mossberg has rolled out a new modular rifle that could provide stiff competition to Ruger’s popular RPR. We are impressed with the New Savage 110 line-up featuring higher-quality, user-adjustable stocks. The all-new AccuFit system/stock allows shooters to customize length of pull and comb height. The new AccuStock features a rigid chassis embedded in the stock. Savage has a full line of revamped 110s with these enhanced stocks. For example, the Savage 110 Storm shown here features a detachable-box magazine, a stainless-steel barrel, and a gray synthetic stock. It is available in many chamberings from .223 Remington to .338 Winchester Magnum. MSRP: $849. Visit SavageArms.com. The HMR Pro is an upgraded version of the HMR, introduced in 2017. The new-for-2018 HMR Pro includes a Cerakoted stainless action and barrel with a threaded muzzle plus a upgraded TriggerTech trigger. All HMR Pros ship with a “proof of accuracy” sub-MOA target. Available chamberings are: .223 Remington ( 1:8″-twist), .22/250 Remington (1:9″-twist), 6mm and 6.5mm Creedmoor (both 1:8 twist, and .308 Winchester with a 1:10 twist. Weight range: 9.2 to 10.10 pounds. MSRP: $1,695. Visit BergaraUSA.com. The MVP Precision looks good. It has all-new chassis with a longer fore-end up front and a fully-adjustable LUTH-AR MBA-3 stock in the back. Every rifle comes with an LBA trigger, and 20″ or 24″ threaded and free-floated medium bull barrels are standard. The action features an oversize bolt handle with a Picatinny rail on top. Available chamberings include the 6.5 Creedmoor (no surprise) and 7.62×51 (.308 Win). Mossberg will also offer combo packages fitted with Vortex Viper HS-T riflescope. Visit Mossberg.com. For fans of traditional wood-stocked rifles, Mossberg has added the 6.5 Creedmoor chambering to the top-of-the-line Revere model. This rifle features a high-grade European walnut stock with rosewood fore-end tip and grip cap. As you can see in the video above, the Mossberg Revere offers a lot of style and performance for the $823 MSRP. New Rifles tip from EdLongrange. We welcome reader submissions. Share the post "New-for-2018 Rifles Will Be On Display at SHOT Show"
Here’s something you’ve probably never seen before — a single-shot, bolt-action pistol chambered for the 6mm BR Norma cartridge. Featured as one of our Guns of the Week a while back, this Green Machine is a Savage Striker upgraded by Chuck G. from Arizona, a self-described “Savage Maniac”. Chuck transformed this Savage Striker single-shot from a ho-hum .308 into a reliable half-MOA precision 6BR that can run with accurized rifles all the way out to impressively long ranges. Here we provide highlights from our original article. Click the link below to read our full Savage Striker article, which is three times longer than this story, and has more photos, plus videos and a detailed load development section. The Striker Project — Pursuit of Precision, by Chuck G.
I didn’t even know Savage Strikers existed until I saw one for sale on Gunbroker.com. I snagged it with a $400 bid. My idea was to build an accurate, long-range pistol on a pauper’s budget. 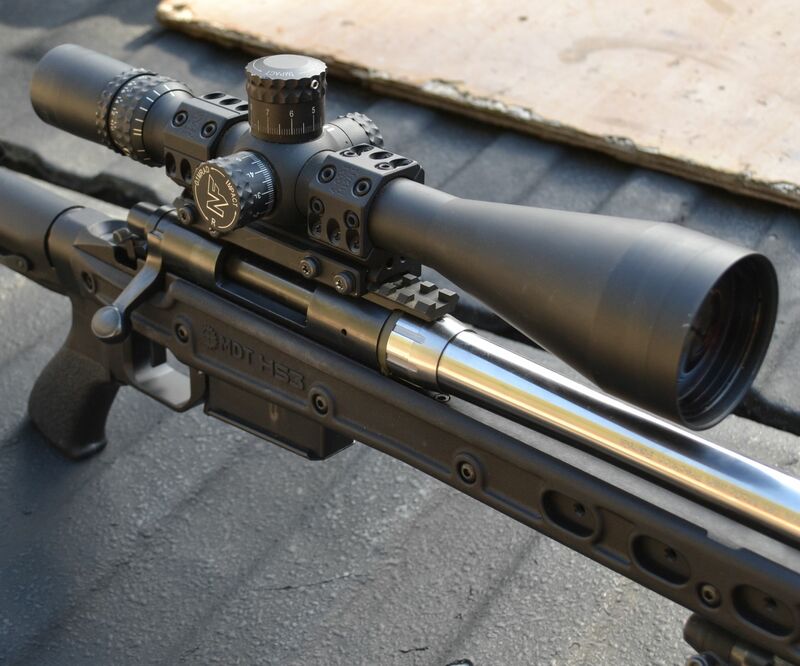 As purchased, the Striker had a .308 barrel with an unknown round count, the standard center-grip, black synthetic stock, an odd two-piece custom brake, and an old Burris 4X pistol scope in a Conetrol 2-piece ring set. The trigger was very heavy, 6-8 lbs I’d estimate, with a lot of take-up and over-travel. My initial attempts to get the Striker to shoot well at even 100 yards were disappointing. I was never able to get better than a 3″, 5-shot group at 100. Not what I was looking for. Being used to benchrest triggers, the pull on this one was hard for me to manage. The gun would roll around on any type of front rest I had, and from a cement bench on a bipod it would jump about 18 inches up and sideways with every round. Not being used to this type of gun, I found the recoil and muzzle blast to be unsettling. It was hard not to flinch. I started off using my 1K .308 rifle load, 175 SMKs over 44 grains of Varget. That probably would have knocked the hell out of a deer, but it wasn’t much fun to shoot from the bench. New Caliber, New Barrel — Way Better Accuracy! I decided to rebuild the Striker in a caliber that would be more fun to shoot. 6mmBR was an obvious choice for all the usual reasons–good brass, wide choice of match bullets, easy to load, low recoil, very accurate, and relatively cheap to shoot. As part of a SavageShooters.com group buy, I ordered a 15″, SS match grade, 3-groove, heavy varmint contour, 10-twist barrel from Pac-Nor. To set the freebore, I provided Pac-Nor with a dummy case with an 88gr LD Berger bullet seated to use as a guide. Total delivered price was $340 chambered and threaded for a muzzle brake from JP Rifles. With further load development and bench practice, the gun is showing even more accuracy potential. Using a 24X target scope, the Striker has delivered 5-shot groups in the 3s and 4s during recent range visits. All in all, I’m very satisfied with the project. I ended up with an accurate, fun-to-shoot gun for under $1,000 including scope, paint, and bedding materials. While waiting for the barrel I started working on the stock. As virtually no aftermarket stocks were readily available for the center-grip Striker, I decided to rebuild the standard black synthetic stock. The grip fit my hand poorly so I worked it over with a Dremel tool and sandpaper, built up the grip with Bondo, filled in some holes and bedded the action using Devcon Plastic Steel. This was my very first attempt at these tasks so progress was slow. Once I had re-shaped the stock, I sprayed five coats of “John Deere” green topped by several coats of auto clear. It came out surprisingly well considering I had never painted a stock before. I had originally planned to build up the fore-end to 3″ wide using Bondo but later decided to just use a Sinclair Benchrest Adapter that I had on hand. Share the post "Half-MOA Handgun — 6mm BR Savage Striker Pistol"
If you’re looking for an ultrasonic cleaning machine — here’s a very good deal. On sale now at MidwayUSA for $104.99, this same unit sells for $139.99 on Amazon. With a powerful 60-watt transducer, this unit can process hundreds of cases at once. The machine boasts a 3.2 quart stainless tank with drain valve, five temp settings, and a 1-to-30 minute timer. There’s even a built-in sensor showing when to change solution. Here’s a verified buyer’s review: “Worth the money… it can heat the solution up to 140° F. The best thing about this cleaner… is that it has a drain port and valve — SO MUCH EASIER to drain compared to [other units].” NOTE: MidwayUSA has been offering free shipping for orders over $99.00 in recent days — check when you order. With this deal you can get a complete 6.5 Creedmoor Howa 1500 Rifle with HACT 2-Stage Trigger for just $329.99. That’s $80.00 less than the price of a Howa 1500 barreled action by itself! ($409.99 at Brownells). This is a no-frills rifle, but its hard to beat the $299.99 price for a solid, multi-purpose rifle. Use “As-Is” for hunting or drop it into a modular stock for tactical/practical games. You don’t need to spend big bucks for an effective spotting scope to view mirage. You can get the Kowa TSN-501 Angled Spotting Scope for just $349.00 from B&H Photo. This is a super-compact scope with 50mm objective and built-in 20-40X eyepiece. Though relatively new, the small, light-weight TSN-501 can perform basic spotting tasks effectively. This doesn’t have the resolution of the $1500+ spotters but this is fine for viewing mirage and shot markers. Put the money you save into barrels and bullets. ELEY, the UK-based rimfire ammo-maker, has teamed up with the Civilian Marksmanship Program (CMP) here in the USA. Now you can purchase quality ELEY-made ammo for just seven cents a round. This new “ELEY CMP Standard” ammunition, available exclusively through the CMP, propels an accurate 40-grain bullet with an average velocity of 1090 fps. These particular paraffin-coated bullets are designed feed reliably through all .22 LR firearm platforms. ELEY CMP standard will be available exclusively through the CMP. Though budget-priced, it “will still be incredibly accurate compared to other ammo at this price point”. There is a limit of two (2) cases per individual per year, priced at $354.95 for 5000 rounds, with Free Shipping to all contiguous U.S. States. NOTE: To purchase this ammo you must register and provide proof of eligibility. If you have a hunting rifle, this item will help you spot your game. With a best-in-industry, transferable lifetime warranty, you can put your trust in this product. It doesn’t have all the “bells and whistles” but it has the key features and performance a hunter needs. For shooters looking for quality construction, simple but 100% reliable controls, this unit (from a big Oregon-based manufacturer) will get the job done, and last a lifetime. CLICK HERE to see Mystery Deal of the Week. Share the post "Bargain Finder 108: AccurateShooter’s Deals of the Week"
The Company President’s Rifle — Fanciest Savage Ever? This unique Savage 99 rifle was created for Joseph V. Falcon, President of Savage Arms in the 1950s. When you run the company, you get some pretty nice stuff — in this case you get what may be the most elegant Savage ever made. This rifle was created for Joseph V. Falcon, who served as President of Savage Arms in 1956. This highly embellished Savage 99 lever-action rifle is chambered for the .300 Savage cartridge. It features deluxe checkering and gold inlays. This presentation-grade rifle boast deep relief engraving with a golden elk on one side of the receiver and a stalking cougar on the other. This rifle was given to Joseph V. Falcon from his friends at Savage in December of 1967. Falcon later donated the rifle to the NRA. This impressive model 99 is currently showcased at the NRA National Firearms Museum in Fairfax, Virginia. Arthur Savage invented the first “hammerless” lever action rifle with the entire mechanism enclosed in a steel receiver. This rifle featured a rotary magazine with a unique counter that displayed the number of rounds remaining. The Model 99, as it became known, was the gun that launched a company. There is an interesting history of the company’s logo which features an Indian chief in feather head-dress. In 1919, Chief Lame Deer approached Arthur Savage to purchase lever-action rifles for his tribe’s reservation and the two men struck a deal. In return for discounted rifles and support, Savage received the tribe’s endorsement. By virtue of that association, Arthur Savage added the Indian head symbol to the company’s commercial trademark and letterhead. Share the post "The Company President’s Rifle — Fanciest Savage Ever?" Are These Really the TEN BEST Bolt-Action Rifles? Share the post "Are These Really the TEN BEST Bolt-Action Rifles?"